Today sees the release of Econsultancy’s E-commerce Best Practice Compendium, which contains more than 170 tips on improving usability and conversions. The report is split into three sections: site search and navigation, product pages, and the checkout process. In today’s post, I’ll look at some tips examples to improve e-commerce navigation. Effective e-commerce navigation should make it as easy as possible for customers to find what they want, and get to the relevant product page as quickly as possible. There are a number of ways to do this, and much depends on the mindset of the consumer. If they arrive knowing what they are looking for, then your site search should do the job, returning relevant results which will take them quickly to the product page. However, a minority of users will typically take the site search option, so people will head for the navigation bar and look to browse by category. Let’s say I want a book on Soviet Russia. Unless I type the name in to the search box, it can be tricky on some sites. I can then select history, then European history. After this, Waterstones leaves me at a dead end. I have a page with more than 44,000 titles and the filtering options only give me price, ratings and author. Not what I need. Amazon does this better. Once I get to the history sub-category I can then search by region and country before choosing the relevant period of Russian history. Auto-complete in site search is a great way to improve the effectiveness of site search and minimise the risk of misspellings and therefore inaccurate results. In my experience, autosuggest provides a real boost to search conversion rates. In a usability test I ran, we found that users actually relied upon site search autosuggest and autocorrect to know the correct spelling of words for them. Make sure that your site search solution is up to scratch, and that you still provide search results for common misspellings, just in case. Another feature to consider is rich auto-complete. It’s like the normal version, but better. Filtered navigation is essential. It makes for effective browsing by allowing the customer to narrow their product selection by eliminating results which are irrelevant to them. 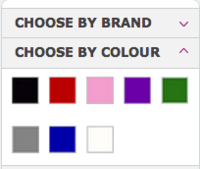 In this example from House of Fraser, my search for a coat is made easier by the sheer amount of filtering options available. I love the way Kiddicare uses its customer review data as a navigational aid, allowing users to see only those products which have been recommended by other shoppers. Drop-down menus are a common feature on e-commerce sites and, used well, they enable shoppers to take a shortcut to the product category or sub-category they are looking for, while also providing a chance to promote certain products or offers. Allowing users to filter site searches from the very start makes it easier for them, and it’s also more likely that they will find relevant results. Not all traffic will come in through the homepage, much will arrive directly at product or category pages, so navigation should be consistent so that people can find their way around the site from wherever they happen to be. For most sites, this means a constant top nav and search bar, as on John Lewis. The only place navigation shouldn’t be visible is during the checkout process, which should be enclosed to remove any distractions for shoppers. Consistency between site search and navigation is also important. The same sorting options and filters should be available to users whether they choose to search or browse. Do you need the carousel? Carousels, or image sliders, are commonplace on e-commerce sites. Essentially, they allow retailers to promote several different products without using all of the space on the page. However, an interesting article on Conversion XL argues that they are conversion killers. They take attention away from other features on the page. They are often too fast and shoppers miss the message. Image sliders suffer from banner blindness. Poor usability. They often move too quickly and navigation controls are too small. This is certainly something worth testing. Whether you use this may depend on the products you sell and the size of the product range, but it can be effective. For example, Christian Louboutin uses this for its shoes. I like the option of browsing by colour, size and heel height and just scrolling up and down looking at product images. This is an excellent example from Sunglass Hut. Showing images of the different styles of sunglasses provides a very useful navigation aid. For more tips on navigation, as well as product pages and the checkout process, see our new E-commerce Best Practice Compendium. Australia and Brazil are the leading countries for percentage of mobile traffic to retailers, 47% and 40% respectively, compared to 31% for the US and UK. The data, taken from 200m visits to Mobify-powered websites, gives a picture of mobile commerce trends around the world. As part of the BBC’s move to responsive design it has launched a revamped version of its sport site that tailors content to mobile screens. We’ve previously reviewed the BBC’s redesigned news site, and the consensus in the comments section was that it’s not technically responsive design, but is in fact adaptive design. The main giveaways are the ‘m.’ URL and the fact that if you resize your browser on a desktop the elements on the page don’t reorder themselves. Nonetheless, it’s great that BBC Sport now has a mobile site as it means reading live football score updates on a Saturday will be a much easier experience. Group-buying seems to consistently experience conflicting states of flux – from reported positive growth, through to states of decline – so it’s arguably difficult to identify the current condition of this segment in the digital industry. However, according to a new report by Telesyte, Groupon has taken the lead as the most used group buying site, travel has become the most popular deal category for consumers and the group buying market looks like it really is moving away from a decline.